May 31, 2018 August 1, 2018 - by FallenAngel - 13 Comments. Up until about a decade ago, asserting anything to the contrary was not only unheard of, not only frowned upon, but is simply not done in good company. It would get one ostracized, treated like a pariah, or worst, made out to be an ignorant idiot. In recent years, however, this assertion has become debatable. Along with it, other assertions such as “the Aquinos are owed for Philippine democracy” are being challenged too. And now we come to the current state of Philippine “democracy”. The current crop of opposition figures claims that democracy is currently dying, and that the Philippines is heading towards a dictatorship. One of the opposition’s talking points is that a “healthy democracy” needs a dissenting voice. It’s not hard to agree with that. But there’s a catch. Yellowtards, arguably the loudest entity in the Opposition, cannot talk about “democracy needing dissent”, while in the same breath dismissing any question and any doubt cast about their own infallibility and dogma. The trouble has always been that when Yellowtards do or say something, they still expect everyone else to take things uncritically. What they claim as the “death of democracy”, is in fact, their non-allies casting doubt and raising questions where applicable. In other words, they can’t take as good as they give. Opposition, may we remind people, is not an entitlement. The credibility – regardless of which side of the political fence you are on – has to be earned through both consistency, and veracity. It is a step in the right direction that some formerly untouchable sacred cows are now being…well, desecrated. It is part of the growing pains of developing a more engaged citizenry. And it is also a step in the direction of forming a picture of history that considers more perspectives than just one that is comfortable. Like GRP webmaster benign0 says, the currency of any debate needs to be intelligent points, and not emotionally-laden ones. Contrary to popular belief, enlightenment doesn’t really start with asking the right questions. It starts with realizing that questions need to be asked in the first place. Next Article Shouldn’t The Best Basketball Be Enough? 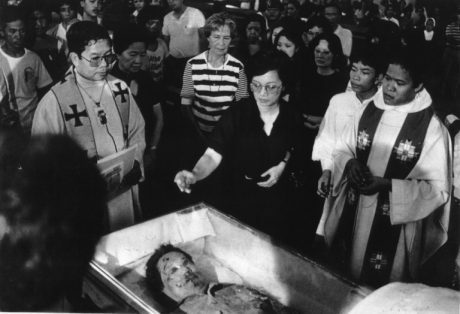 Why did most of the clueless and non thinking Filipinos ; just believed that Ninoy Aquino, Jr., is a hero ? It may be because, it was being broadcasted, in the mainstream media; 24 hours a day, six days a week to dumb down the stupid Filipinos.The late Pres. Cory Aquino, his widow, even ordered the Department of Education, to put the tale of his heroism in textbooks. Succeeding generations of Filipinos, must be brainwashed also that , Ninoy Aquino, Jr. is a hero…Equal or even greater, than Dr. Jose Rizal, and other heroes…Manila International Airport is renamed after him. Rizal Memorial stadium is renamed after him. Buildings, or whatever you got, and others are renamed after him. His smirking face together with his wife’s nasty face, are in our currency. Only two, are missing, the faces of: Pnoy Aquino and Kris Aquino’s . We are all brainwashed, that we owe our “democracy” to him. He died for us, like Jesus Christ, died on the cross for our sins. The Roman Catholic Church, supported this claim : “we are people worth dying for…” Cardinals, bishops, priests, nuns, etc., attested to this , as truth. Some sort of brainwashing was done to us, resulting in electing his mentally retarded son, Pnoy Aquino, as our President. We deserved what we got… How stupid can we get ! TO SEE THE COMMENT POSTED BY 676 HYDEN TORO makes me realize just how stupid Filipino’s are. They really believe what they think. Cory Aquino had a “NASTY FACE”, WHAT ? the woman was a “HAUS-FRAU” and an actual SWEETHEART and anyone could see that, the fact that she ended up being thrust into the Presidency is an Historical Accident. BUT FILIPINO’s are so virulently Anti-Aquino or AntiMarcos that they FAIL (as in FAIL-IPPINES) to grasp the fact that there is not a single politician in the entire country that is NOT a LYING THIEVING SCUMBAG, not a single one….and that they ‘theatre-of-the-absurd’ that is the political theatre in the country is just that : “A THEATRE” with a pre-written script to follow that is trotted out by the Main-Stream Media in the country that works hand-in-hand with the government and in turn the gov’t. is told what to do by the USA Dept. of State, been this way for decades and if the Neanderthal in charge now tries to change it, he will get thrown out of a plane and land on the same Tarmac NINOY AQUINO LANDED ON !!! I stand by my comment. Cory Aquino had a nasty face. YellowTards like you, may look at her as ” sweetheart”. However, I look at her as a Hacienda Luisita tenants/peasants murderer ; and a political opportunist, who raided the National Treasury, with her Oligarchs friends and relatives. She sold government corporations to her fellow oligarchs. She was the “Mother of Political Patronage” ! Cory Aquino had a “NASTY FACE”, WHAT ? the woman was a “HAUS-FRAU” and an actual SWEETHEART and anyone could see that, the fact that she ended up being thrust into the Presidency is an Historical Accident. And you’re easily deceived with that? It’s sad and pathetic that you wouldn’t want to admit that she’s a crook as well. Inefficient leader, had her own personal cronies, paying her media friends to make things look good during her term, spent TRILLIONS more than Marcos did, throws a tantrum when called out by a journalist and sues the poor guy later. As always, you’re grasping on straws. Anyone who opposes a dictator is a hero, they say. So people who opposed BS Aquino during his presidency should be heroes too. For some reason, that doesn’t happen. Oh yes, partisanship is the reason. Who they tell you to worship as the hero should be worshipped… otherwise, you’re a pasista or supporter of a dictatorship. Ninoy Aquino, Jr. is the consummate political opportunist. He was a buddy of Jose Maria Sison, and Benarbe “Kumander Dante” Buscayno, of the NPA. The New Peoples’ Army (NPA), has murdered a lot of people, until now. It is collecting “Revolutionary Taxes” or protection racket, to businesses and people. It has degenerated into a “Mafia Entity” . The Hacienda Luisita, which Ninoy Aquino, Jr., had scammed, from the Philippine government , was protected by the corrupt, Cory Aquino and Pinoy Aquino, during their terms. Hacienda Luisita tenants were murdered by the Aquinos, during the Hacienda Luisita massacre. Or, he may had earned the ire of the U.S/C.I.A., because of his “unholy alliance” with the Philippine communist front: the New Peoples’ Army. The U.S. had just been defeated in Vietnam. Another communist incursion in the Philippines, would be another problem for the U.S. The ‘Domino theory” , regarding Southeast Asian nations, falling to communism, was spreading to the Philippines. It was also, a “betrayal of trust” to the U.S./C.I.A., by Ninoy Aquino Jr., ” unholy alliance” with the Filipino communist front. So, he had to be liquidated. Betray the U.S./ C.I.A., and you are a “dead man walking” . Only history will judge, if the Aquinos are better than the Marcoses. It is too early to judge them now ! NO, NOT REALLY….AQUINO was MURDERED by the long arm of the CIA. To rid the PHILIPPINES of someone who had Double-Crossed the USA Dept. of STATE , and Westinghouse Corporation……that someone was Ferdinand Marcos. If you are old enough, You will recall that after Aquino was murdered everyone thought Marcos was behind the murder (Marcos had NOTHING to do with Ninoy Aquino’s Murder, NOTHING !) but the fact that there was no blood feud afterward suggests that the Aquino Family knew that Marcos had nothing to do with the Murder…and that the beneficent USA, expecting concessions from the Failippine Gov’t. that Marcos would not concede, was going to drive the grieving Widow all the way to Malacanang Palace to make up for shooting her husband ! LMAO, if they do not write the history books it will be known that all of them were lying thieving SCUMBAGS !! Marcos being the SUPREME SCUMBAG OF THE LOT !!! That’s a laughable statement that you even tried to overrate Marcos like that. 30 years ago, there was just one plunderer. Today, there are plunderers left and right that if you total what has been plundered for 30 years, that one plunderer 30 years ago now looks like an amateur. The national budget during the military rule looks like peanuts now compared to the three Trillion budget of today. And yet, they trumpet that Yellows are of Daang Matuwid. Indeed, a lie that is repeated often enough becomes a truth. THE USA WAS NOT DEFEATED IN VIETNAM, AND COULD HAVE BOMBED THE COUNTRY BACK TO THE STONE AGE at any time, LIKE THEY DID DURING THE CHRISTMAS BOMBINGS IN HANOI IN 1972 THAT HAD THE NORTH RUNNING TO THE PARIS PEACE TALKS, the ELITES in the USA were losing control of the Country due to the War’s un-popularity ,and so had to declare a truce and then left…..The WAR MACHINE IN THE USA IS BIG BUSINESS, the biggest most profitable business of them all, AND the USA WAR MACHINE IS NOT CONCERNED WITH WINNING A WAR, BUT PROLONGING WAR…as it is better for business.. Retreating from a war, is equal to war lost, or defeat. ” There is no substitute to victory.”, as U.S. Gen. McArthur, had stated. The U.S. does not like prolonged wars. Like the wars in : Afghanistan , Lybia, Somalia, Yemen and Syria. War is big business for Americans, Russians, Chinese, South Koreans, Industrial countries in Europe, etc…This is the reason, conflicts are in the Oil rich Middle Eastern countries. The Middle Eastern countries have money to buy arms, and finance wars. Vietnam war was similar to the Korean War. North Korea was the site, where Communist China and the former Soviet Union fought an undeclared war. It was a dangerous war. Soviet Union could had Nuked the U.S. The U.S. could had Nuked the Soviet Union. It is more dangerous now, as other countries have nuclear weapons. If they had expanded and prolonged the Vietnam War. It would had resulted to Nuclear War on both Superpowers. No winners. all of us are losers. The Cuban crisis in the ’50 s, nearly led us to a nuclear war. Soviet Union leader, Kruschev sent nuclear missiles to Cuba. Just about 90 miles to the U.S. State of Florida. Cuba’s leader, the late, Fidel Castro, asked the Soviet Union, for these nuclear missiles, as a deterrent from the U.S. , from invading Cuba. There was a standoff, as the late U.S. Pres. Kennedy, ordered the blockade of Soviet Union’s ships carrying nuclear land missiles to Cuba. Diplomacy won. Cuba got the promise from the U.S., that it will not invade Cuba. We were near the U.S. – Soviet Union nuclear war, during that time. Out of all the addictions in the world, attention is slowly but surely becoming one of the most dangerous.